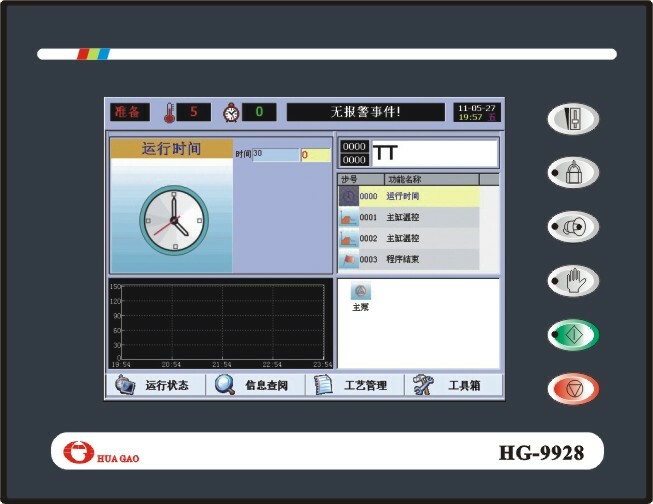 HG9928 dyeing machine controller uses large-size and high-quality LCD touch screen, Windows operating system, which can comprehensively monitor the VAT workflows. It supports Chinese and English language input, with high-capacity storage, and it can record a large number of processes. In addition, it is equipped with USB interfaces and Ethernet interfaces, to connect enterprise ERP, or achieve remote service via Ethernet, saving the time and costs. It is an excellent representative integration control in the Information age. Control technology: It adopts Intel X86 embedded processing system, Windows operating system and imported touch screen. Display：640×480 pixels 10.4 inch high quality imported LCD screen. Storage: It can store hundreds of processes, each process contains hundreds of programmable steps. Data protection：Multi-level administrator password protection and USB backup. Communication：One RS485/CAN communication interface，One RS422/485 communication interface，One RS232 communication interface，One 10/100M adaptive Ethernet interface. With the communication interface, you can connect to enterprise ERP and conduct remote services. Information query：It’s able to record hundreds of complete production process curves, hundreds of alarm events as well as 24 hours of continuous production process curves within a day. Parameter setting：Different control requirements can be achieved using parameters, including water inlet, drainage, temperature control, fabric speed and other parameter. Function definition：All of inputs and outputs of switches and analogs can be defined. Function：Accurate temperature control and fabric speed control improve the dyeing quality and stability of the dyeing machine. Consumptions of electric power, water and steam etc. can be measured.